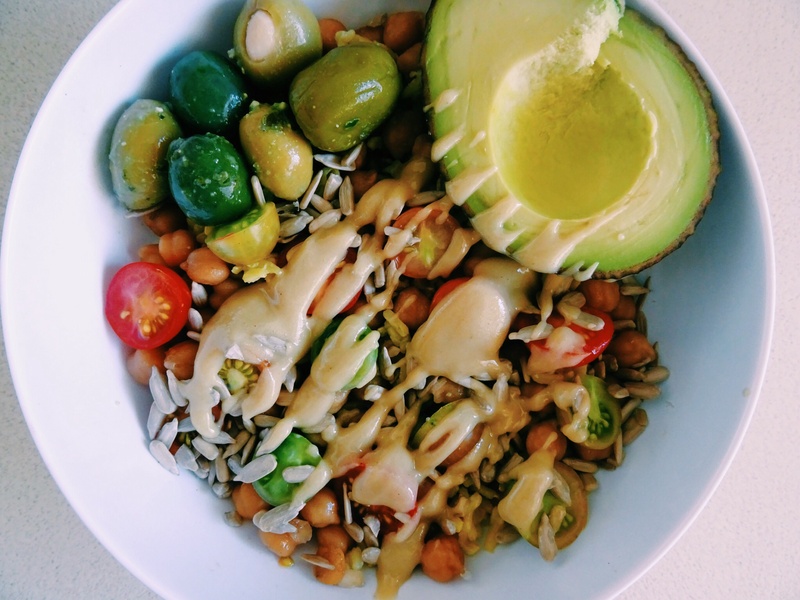 1.Mix the rice, chickpeas, sunflower seeds and cherry tomatoes together in a small bowl. 2.Strategically, and most importantly aesthetically (as you’re sure to instagram it), place the avocado half and olives on top of assembled goodness. 3.Place all dressing ingredients in a small jar and do the T Swift (shake shake shake it off) until smooth and creamy. 4.Drizzle mouthwatering deliciousness (dressing) beautifully over salad. 6.Lastly, using a fork, vigorously mix entire salad/lunch in order to coat each and every ingredient in delicious creamy dressing (note: this may will cause all aesthetically to diminish. However; by this stage you’re sitting on 10 likes/hearts and of course, that’s really all that matters). *vital – especially if hoping to survive in this media age or life as we know it.